In some situations, rebuilding an organ with a new key action or in an improved form may be appropriate to overcome inherent problems. This must be planned with great care if the instrument is to retain its character and musical integrity. After 100 years of use, the patent Walker tubular pneumatic action was becoming extremely unreliable. Temporary modifications had kept it going the past thirty years, but by 2008 it was obvious that major work was needed. After extensive discussions it was concluded that restoration of the pneumatic action was not a sensible course of action, since the interior of the organ was so cramped as to make maintenance impossible. 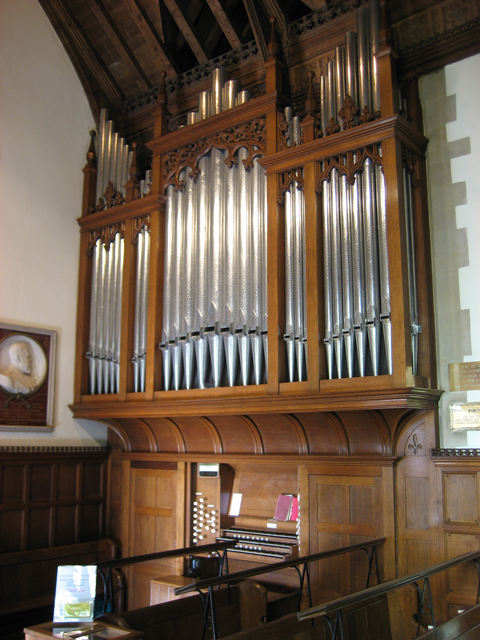 To coincide with the organ's Centenary, during 2009 we undertook major renovation of the instrument complete with a new electro-pneumatic key action. This involved remaking the original power pneumatics which are now triggered by 'compound' electromagnets, which have the advantage of lightweight moving parts and no pivots to stick. A microprocessor control system now takes care of all coupling, extension and piston capture requirements. We also addressed another problem: The organ chamber always remained cold even when the church heating was in use, and this caused major problems with the tuning of the organ in winter. A specially designed ventilation system now draws warm air through the instrument, completely overcoming the issue. From the organist's point of view, apart from additional thumb pistons, the console, although restored, seems unaltered from its original dignified appearance. The key action however is a revelation, never have we experienced a non-mechanical action which is so fast and responsive! The work, paid for by donations from H.M. The Queen, and other friends and parishioners of the church is considered an unqualified success.